The Maltese is a devoted breed that has been around for many generations. These little white dogs are extremely playful and boisterous and make perfect companies for homebodies. They don’t shed, nor do they require an exceptional amount of exercise, making them ideal apartment dogs. They are extremely affectionate and are a true lap dog. They will lie directly on, or against their owner when relaxing. The one true wish of the Maltese is to be with their owner all the time. Their trust, loyalty and affection have made the Maltese a popular choice for over 28 centuries. The Maltese is the ancient dog of Malta. For more than 28 centuries the Maltese has been an aristocrat of the canine world. Ancient historical documents such as painting and poetry are a testament to how beloved Maltese were to their owners. For instance, the Spanish poet, Marcus Valerius Martialias, born in 40 A.D., wrote a famous epigram dedicated to the Roman governor of Malta, Publius, and his Maltese Issa. It is also know that the Greeks erected tombs to the Maltese. In addition, there is a variety of ceramic art that depicts the breed, which dates back to the 5 th century. All of these ancient artifacts prove that the Maltese was adored by those who were powerful and wealthy. They were considered to be a true object of beauty and value. Although the Maltese has been around for centuries, it wasn’t until the late 19 th century that the American Kennel Club recognized their existence and had the breed registered in 1888. Today the Maltese has become a companion and an object of affection to more than those who are wealthy. Their merriment, lovability, and devotion is something the average family can enjoy. The Maltese is a gentle and loving breed. He is very proud, playful and lively. Maltese love the outdoors and do require sufficient exercise (2 walks a day for at least 10 – 15 minutes). However, they are very active inside and are happy with apartment life. The Maltese is a highly intelligent breed, as well as courageous and bold, which is a common trait among many of the dog breeds apart of the Toy group. He likes to bark at unfamiliar noise. This makes the Maltese an exceptional watch dog, as they will alert their owners to any suspicious sounds. The Maltese is small, only growing to about 8 – 10 inches at the shoulder, and weighs about 7 pounds. Although they are prone to a number of diseases that tend to be present in most small dog breeds such as slipped stifles, and eye and teeth problems, Maltese are long lived, and on average live for 15 years or more. Maltese are quite friendly and enjoy the company of most people. However, if they are not socialized properly as pups, they can become jealous or suspicious of strangers and be overprotective of owners. Maltese are good with other animals and children, as long as the children know how to handle the dog. Keep in mind, a Maltese won’t hesitate to snap at a small child if the child is teasing or unknowingly abusing the dog. While the Maltese has many admirable qualities, like every breed, they have certain aspects that may not be considered desirable to some. For instance, although the Maltese does not shed, his silky white coat does require daily grooming, and will need to be trimmed as it does not stop growing. They also are prone to tear stain, which means their eyes will also require daily cleaning. Moreover, Maltese are often picky eaters, and it may be difficult to find a food they like. They can also be a challenge to train. They need persistent training at a young age. 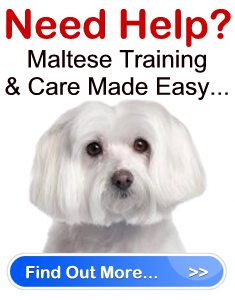 In essence, the Maltese is a sweet tempered dog that loves people, especially their owner. This makes them a perfect choice for a first time dog owner who is looking for a small companion, as long as they are committed to providing the Maltese with all of the care and love it requires for the duration of his life.